Not Your Typical Erev Pesach...Then again the times we are currently living in are not typical either. For several weeks now, our community and its wonderful organizations and Rabbonim have found themselves steeped in "Erev Pesach" work. Certainly, here at Achiezer, numerous families are being dramatically helped with Yom Tov expenses in the most dignified and humble way. Medical and mental health emergencies, health insurance and hospital issues, families in crisis and doing all that we can to be there for our community. While nobody in our community ever wants to have to spearhead a community service as a reaction, sometimes there is no alternative. While fire safety is certainly a human issue, it is certainly a greater responsibility in our Jewish communities. Stoves, crock pots, hot plates, urns, blechs and so many special devices utilized on Shabbosim and Yomim Tovim. Certainly, there is no greater mandate than ensuring the safety of our children and our families. In addition, having sufficient smoke and carbon monoxide detectors in our homes is not a luxury. It is a basic necessity that we all must have operating in our homes 24 hours a day, 7 days a week. To that end, the community mission changed this Erev Pesach. Our community banded together to make sure that safety is a top priority. In a beautiful display of communal unity, two simultaneous events with one key focus of safety in mind, took place this past Sunday. 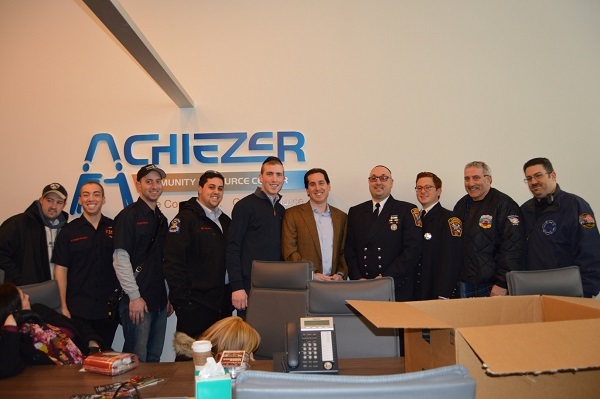 One event was held at the Achiezer Far Rockaway Office on Beach 9th Street, while the other took place at the Central Avenue location in Lawrence. Hatzalah, Shomrim, Chaveirim, the JCCRP, the JCC of the Five Towns and Achiezer all joined together to host these critical events. The Fire Department of New York along with the American Red Cross set up an incredible display at the Far Rockaway location. The Woodmere Fire Department along with members of the Lawrence-Cedarhurst Department literally held a massive audience spellbound with fire safety techniques, lessons and practical hands on instructions on installing smoke and carbon monoxide detectors. Shockingly, or shall we say not surprisingly, nearly 200 smoke detectors were distributed with many more requested. We would like to express our gratitude to Assemblyman Phil Goldfeder, Councilman Donovan Richards, Senator Joe Addabbo, Assemblyman Todd Kaminsky, Councilman Anthony Santino, Nassau County Executive Ed Mangano and Councilman Bruce Blakeman for ensuring the success of these events. As we all know, "he who saves one life is as if he has saved an entire world." While we all hope that all of these measures will ultimately be strictly precautionary, it will all have been worth it for even one life that can possibly be saved as a result. May the z'chusim of these events be an aliyah for the neshamos of the beautiful Sassoon children who were tragically taken from Klal Yisroel. In addition, all of the smoke detectors distributed were sponsored privately l'iluy nishmas the Sassoon children.